The why: Speed speed speed. The Wildcats have been faster than everyone they’ve played, and that should apply to the (1-2) Jaguars as well. Armstrong has beaten Thomas Jefferson, John Marshall, and Colonial Heights by a combined 102 points with scores on offense, defense, and special teams. We expect Head Coach Kedrick Moody’s Wildcats to be (4-0) heading into a trip to Varina on October 3rd, and then we’ll see how good they really are. Moody is in his third season at the head of the Armstrong sideline. Last season the Wildcats finished 3-7 and advanced to the 3A regional playoffs, but Moody and his squad have their eyes on bigger things. 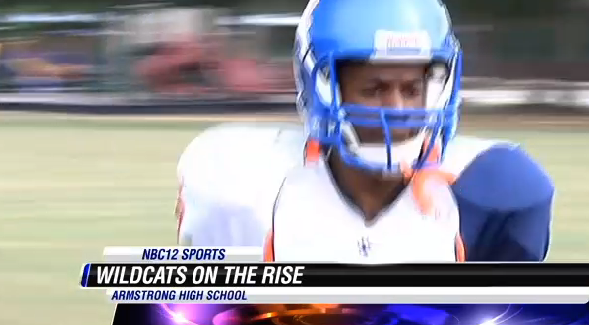 Armstrong is out to its first 3-0 start since 2010. With a victory at Glen Allen this Friday, the Wildcats would win their first four games for the first time since 2006. So far this season, the Cats are averaging 48 points per game, while allowing an average of eleven points per outing. While the team knows the competition will get steeper, it’s certainly a good start.